Special Representative Roger Meece (centre) visits Goma defence lines in Kibati and Kibumba in the DR of Congo. 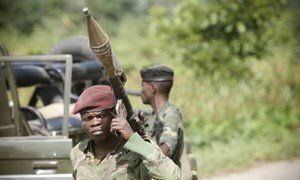 The United Nations peacekeeping mission in the Democratic Republic of the Congo (DRC) used two of its attack helicopters on Thursday in support of the country’s armed forces to deter rebel soldiers – known as M23 – near the villages of Ngugo and Nysisi in North Kivu. The group, which is composed of renegade soldiers who mutinied in April, is reportedly led by Bosco Ntaganda, an army general wanted by the International Criminal Court (ICC) on charges of war crimes for recruiting and using children in combat in the DRC’s north-east. The M23 fighters had been seen to be moving south toward Goma, the capital of North Kivu. The UN mission, known as MONUSCO, had also received reports of human rights violations by the M23 in that area, UN spokesperson Martin Nesirky told reporters in New York today. “The Mission attack helicopters used rocket fire and missiles to deter their further advances and to protect the population. MONUSCO is assessing the impact of the operation, which took place in a remote and heavily forested, mountainous area,” he said. The Secretary-General’s Special Representative in the DRC, Roger Meece, called for calm and reaffirmed MONUSCO’s determination to protect civilians and support the Congolese armed forces, known as FARDC, to secure the main population centres. Mr. Meece, who is currently in Goma, also met with local authorities, the leadership of the Mission and FARDC members to discuss the security situation. The fighting between Government troops and the M23 has displaced more than 220,000 people, including many who have fled to neighbouring Rwanda and Uganda, the UN Office for the Coordination of Humanitarian Affairs (OCHA) reported today, expressing concern about reports of the recruitment of minors into armed groups in a number of towns. OCHA spokesperson Jens Laerke stressed that the Office has remained on the ground and is trying to reach those who were most affected by the conflict. For its part, the World Food Programme (WFP) plans to resume delivery of food assistance early next week after having to suspend its deliveries to 55,000 in Walikale due to insecurity and restricted movement of UN staff. WFP spokesperson Elizabeth Byrs stated at a briefing in Geneva that the agency currently has enough food stocks to meet the needs of 320,000 beneficiaries with two weeks of rations. However, she noted that 600 metric tonnes of supplementary food per month were still needed for the coming weeks. In calls with the leaders of Rwanda and the Democratic Republic of the Congo (DRC), Secretary-General Ban Ki-moon today expressed grave concern over reports that an armed group of former soldiers in the eastern DRC is receiving external support, according to Mr. Ban’s spokesperson.